THINK GOLDEN! YOU NAME IT, WE BUILD IT! When you think construction, think Golden! We are one of the largest providers of home improvement services in the North Bay. From new construction to remodeling, we do it all! All of our work is guaranteed! We are bonded, insured, and licensed. We will gladly provide you with references. Marin Construction, Restoration and Remodeling From A Company You Can Trust! Save $750 on your next project! Click here to download coupon! ON TIME AND ON BUDGET! Our quality work is well established and your satisfaction is guaranteed! All our work is on time on budget! We specialize in problem solving, renovations and additions, general contracting, remodeling-all types, and elegant baths and kitchens. We provide quality work, the best service, the best prices, and the best overall value in the entire North Bay! FREE ESTIMATE! For a free estimate on any size project, please call us or send us an email. We will promptly dispatch an estimator to meet you. 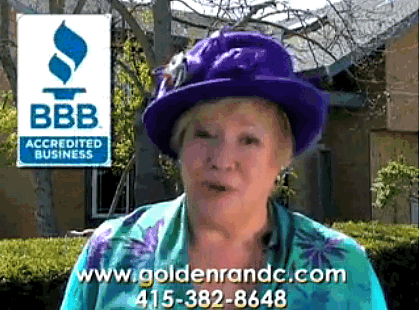 We are proud members of both the Marin Builders Association and the Better Business Bureau.(BBB). Please contact us for a FREE In-Home Consultation & Estimate on your next project.